Certified Video Depositions Services | Shereck Video Services, Inc.
Video depositions are the video record of each key witness deposed. Video captures everything, both audio and video. Often times the written transcript of a witness doesn’t fully describe the subtleties and body language of a person giving the testimony. 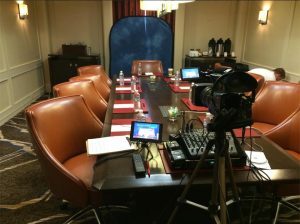 Having a professional legal videograher can show the true character and mannerisms of a witness on the stand that may not translate on a written document. This can be crucial in helping to determine if the person is being untruthful or sincere for a judge and jury. Many law firms today understand how video depositions are a powerful tool in conveying the true intent and demeanor of a key witness. Video Depositions also help prepare any witness before the trail to ensure the best possible outcome under questioning. Our certified legal video specialists are experts in assisting law firms across the county. We want our clients to think of us as an extension of their law firm that strictly handles all of the legal video services. Call us today to schedule an appointment and consultation. We have over 17 years worth of experience. Let us help maximize your case.